The sage Shankaracharya discovered one of life’s great lessons early on: if we fail to hold fast to our inner self, we will be ground up by the millstones of our workaday lives. This realization came when, as a child, Shankaracharya encountered a woman milling wheat in the marketplace. The sight of it upset him so deeply that he ran to his teacher in tears. “Our life is just like that,” he cried. “We are all ground up, day by day, by the millstone of time.” His teacher returned with him to the market and lifted the top stone. “Look,” he said. “The grains that hold fast to the post at the center remain whole; only those that do not are lost.” Shankaracharya was impressed and made good use of this insight in his later years. We too can make good use of it—on many levels. This teaching applies as much to the physical condition of our bodies as it does to our spiritual lives. Over years of use, our joints can get 'ground up'— creaking, popping, and wheezing under the stress of their loads. The confluence of a few simple factors can create a perfect storm of stress in the hip joint,which can lead to hip pain, especially for those leading an active life: joggers, walkers, weekend athletes, and, of course, asana practitioners (when we are not careful). 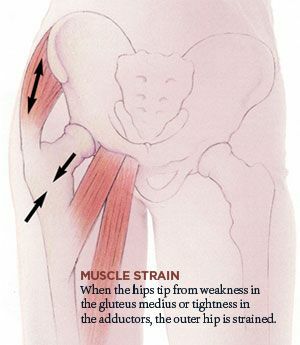 To understand the problem, and the hip pain that can result from it, we’ll look at two important sets of muscles: the adductors (muscles of the inner thigh and groin that draw the legs toward the midline of the body) and the abductors (muscles of the outer hip that move the thighs apart, away from the midline). In most of us, the groin muscles (adductors) tend to be tight, pulling the heads of the thighbones into the sockets. The thighbones are meant to be centered in the socket and stabilized by the abductors, which oppose the groin muscles. But when these abductors are weak and stressed, as they often are, the resulting imbalance causes grinding, deterioration in the joints and the hip pain you may be experiencing. But this doesn’t have to be so. Yoga gives us the tools and the understanding to “hold close” to our spacious center, not just for the sake of our spiritual lives, but also for the health of our hip joints and the graceful aging of our bodies. Yoga, which aims for balance and harmony at every level of life, can help us stabilize and revitalize our hip, and to prevent hip pain and injury. There are two sets of adductor or “groin” muscles. The shorter set extends from the pubic bone to the inner thigh, and is often injured. These muscles tighten from prolonged periods of sitting, driving, or postural stress. This tightness is increased by activities that torque the pelvis, such as running with bad form, carrying a growing child on one hip, or performing asymmetrical yoga postures improperly. This tension can also be brought on by emotional stress, which causes us to contract and huddle the thighs together. The resulting injury is the classic groin pull. Sudden or forceful stretching, especially when muscles have not been warmed up, causes muscle fibers and tendons to tear. When a runner’s forward leg crosses over the midline, for example, the short adductor muscles tighten and strain. The stress increases when running uphill—including when running on a treadmill. 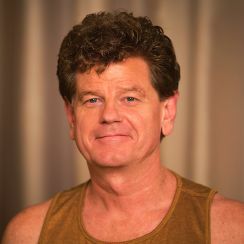 Injury can occur in asana practice as well. The groin adductors are strongly pulled when we draw the pubic bone back away from the inner thigh of the forward leg in postures such as the revolved triangle (parivritta trikonasana) or the single-legged pigeon pose (eka pada rajakapotasana). In these poses, we are often instructed to “hug the midline,” but in doing so we may actually be gripping too tightly, failing to create the space necessary for the bone to find its center in the hip joint. 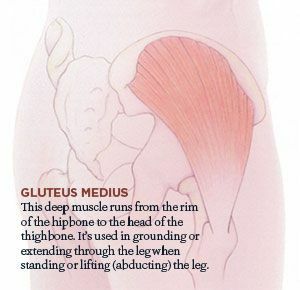 The primary abductor, the gluteus medius, helps stabilize the thighbone in the hip joint, keeping the hip secure. By drawing the hipbone toward the head of the femur, this abductor keeps the hip secure and maintains the space in the joint against the pull of the adductors toward the midline. With every step we take, the gluteus medius prevents the pelvis from tipping sideways and keeps the thighbone centered in the joint. As with the adductors, strain on the gluteus medius is magnified by activities in which the pelvis is twisted and turned, such as running and pivoting. The muscle works especially hard when all the body weight is placed on one leg—such as in balance poses like the half-moon pose (ardha chandrasana) and the tree pose (vrikshasana). When the gluteus medius is weak and the groins are tight, it gets injured, and this injury can cause referred pain that extends into the lower back—often called “lumbago”—as well as pain that can be mistaken for sacroiliac joint dysfunction. Balancing the tone of these two sets of muscles will help prevent injuries and hip pain. It will also awaken new understanding of the dynamics operating the legs, hip joints, and pelvis. This deeper level of awareness begins with attention to the simple standing posture—tadasana. When we extend through our legs and stand tall, there is a natural outward rotation to the thighs caused by the gluteus maximus and other rotator muscles deep in the pelvis. Excessive rotation can cause problems in the hips. 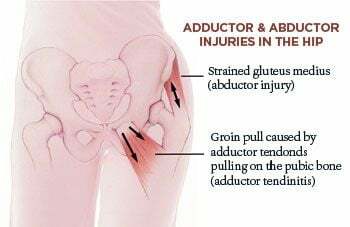 The gluteus medius is not a rotator; it has a more benign partnership with the adductors, creating a balance between adduction and abduction, contraction and expansion. This relationship is sustained, so long as we remain light, open, and lifted at our core. With the right inner dynamic, the more we ground firmly through the legs, the more we can lift at the core. Finding the right balance between adductors and abductors presents two challenges. First, as we stand we must learn how to release the tension held in the groin—the upper part of the inner thighs. Next, we must discover how to extend through the legs without overusing the buttock muscles and hardening the groin. Both of these actions require us to properly engage the longer, deeper set of adductors running from the sit bones to the inner knees. A yoga block is a helpful tool for finding this balance between the adductors and abductors. The block teaches us how to soften the groin and draw the upper inner thighs back toward the sit bones—without simultaneously rotating the thighbones. In the process, the stage is set for the balancing action of the gluteus medius. Begin by placing a block between your upper thighs—it will give you feedback on the actions of the adductors. Place your hands at the hip creases, with your index fingers resting along the lines of the creases so that you can feel the tone of the groin muscles. Bend your knees to keep the thighbones parallel. This will neutralize the rotator muscles to some degree, making the action of the adductors more apparent. Shift your weight a little more into your heels, softening your toes. Now gently engage the adductors, but without tensing them. “Melt” your upper inner thighs back toward the sit bones, drawing the block back without gripping it. Sense this action coming from the backs of the inner thighs. You will feel the groin muscles soften and deepen under your index fingers. With this softening, your sacrum tips forward (at the top) into your body, increasing the arch in your back. In this way, you “spiral” the adductors in toward the center without significantly rotating the thighbones inward or tensing them. Initially the action feels like a softening, “undoing” tension in the groin. But as you continue, centering the thighbone in the joint also requires an active expansion in which the thighbones move laterally in the joint. So next, firm your inner thighs at a deeper level—not in the groin under your fingertips, but rather along the whole inner edge of your thighs extending back to your sit bones. These deeper adductor muscles have already been partially engaged. Firm them more, so that the muscles press outward against your thighbones. The inner thighs act like the poles of two magnets, repelling one another (rather than attracting). This opens the pelvic floor. Next, begin to straighten your legs. This is where the gluteus medius comes into play. Imagine your tailbone is becoming heavy and descending toward the floor. Sense this weight as if the tailbone actually were a tail, descending and slightly scooping forward. Keep your inner thighs melting back, balanced by this downward release of the tailbone. As your tailbone descends, continue to straighten your legs, gradually firming your quadriceps (fronts of the thighs). Your inner thighs will begin to work more strongly to keep the block back, and you will be able to feel if they grip the block too strongly. Maintain balance between drawing the block back, and descending and grounding through the tailbone. 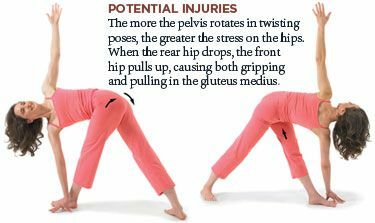 As you straighten and extend through your legs, you can sense the activity at the tops of your buttocks and the sides of your hips, which is the work of the gluteus medius. Slide your thumbs back to the top of your buttocks, and see if you can feel which muscles are working there. Also notice if the large buttock muscles—the gluteus maximus—begin to grip inward toward the tailbone, over-contracting, and thus rotating your legs out and tightening your hips. Keep the feeling of space at the center of your pelvis as you straighten your legs. In this case, “holding to the center” is a delicate yet dynamic balance that is both grounded and expansive. Your heart lifts and opens, and your lower back—while maintaining its natural curve—feels relaxed and extended. In other standing poses—particularly in twists—the same actions are at work, but much more strikingly so. The revolved triangle and rotated half-moon poses are especially good examples because they can relieve hip pain and lower back pain when done well, or cause cramping and grinding in the hip joints when done poorly. To learn the right action, you can try practicing the revolved triangle (parivritta trikonasana) with the help of a partner. Have your partner stand with one foot placed at the outer heel of your back leg—a reminder to remain grounded there. Wrap a belt around the inner thigh of your back leg. Once you have come into the twist, have your partner pull very gently on the belt, diagonally to your hips. He or she should pull just enough to help you keep your hips level and stable, while gently pulling the inside (medial) end so that the upper inner thigh muscle (but not the thighbone) spirals in and back toward the sit bone. The belt imitates the firmness and support of the inner thigh muscles; the idea here is to learn to create the same action on your own, keeping both hips level. Now focus on the front leg. Start by making sure of your alignment. Bend your knee slightly and adjust your thigh as necessary to line up these three points: the sit bone, knee, and heel. 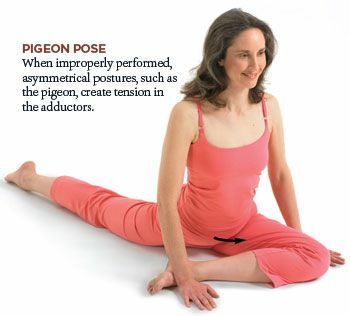 Then straighten your leg, and you will feel your outer hip becoming engaged, firming and strengthening. Next, keeping the quadriceps firm, draw your lower belly up as you extend through your leg into the earth. Ground the leg from behind, from the place where your thumb rested on the top of the buttock in the previous exercise. Feel the line of energy moving down from there through the center of your buttock and your thighbone, while drawing the outer corner of your hip back. Pay attention to the combination of stretching and strengthening taking place in the front hip. Don’t overdo the extension through the leg, which will tighten your lower back and cause it to round. By the same token, if you don’t extend enough, your rear hip will drop excessively and you’ll feel an uncomfortable strain at your outer hip (the gluteus medius), and a gripping in your inner thigh. With a balanced effort, the gluteus medius will lift the dead weight of the pelvis off the front hip joint. Your hips are made level by the combined effort of the inner thigh of the back leg (with the help of the strap) creating lift and expansion and the grounding and extension through the front leg from the action of the gluteus medius. The end result is openness, strength, and stability in the hips. 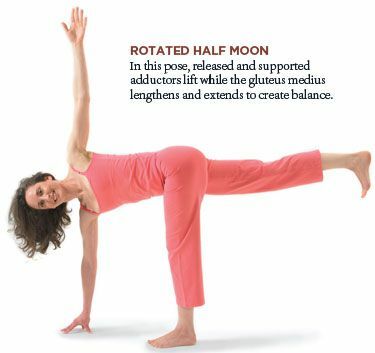 The challenge to these muscles increases in poses that balance all the body’s weight on one leg, especially when the balance is combined with twisting, such as in the rotated half-moon pose (parivritta ardha chandrasana). Here, lifting the back leg demands even stronger work in the inner thigh, and the front leg is grounded through increasingly powerful stabilizing efforts of the gluteus medius. The outer hip and buttock work strongly to level and stabilize the hips. Working with the hips in this way can not only help to prevent hip pain and injury, it also reminds us of the lesson Shankaracharya learned in the marketplace centuries ago. It is a lesson as important to apply in daily life as on the yoga mat. By holding to our center, spiritually and physically, we can achieve firmness, expansiveness, and an inner sense of freedom.